Acknowledging that you’re having trouble managing your finances is the first step to getting back on track. Credit card debt is one of the largest problems in Australian household finance, so we’ve listed some simple ways to help make credit card debt a thing of the past. You’ve been paying the minimum balance on your card for as long as you can remember. You know too well what an overdue statement looks like. You avoid opening your statements for fear of what’s inside that dreaded envelope. You don’t bother sticking to a budget because everything just ends up on the credit card anyway. You hide statements from your partner because you keep telling yourself you’ll have it under control soon. 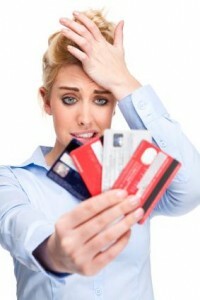 If you found yourself recognising any of those situations, it’s time you thought about how you can reduce your credit card debt. When your bill comes each month, try to pay all of the current charges, plus the monthly fee. Then pay as much as you can afford (aim for 10%) of the old balance. Pay attention to the interest rate too; if you’re expecting to carry a balance from month-to-month then you might consider transferring your debt to a lower interest credit card. Literally. Put it in a container of water and stick it in the freezer. When you’re faced with the temptation of an impulse purchase, instead of having your card in your wallet, it will be trapped under ice. You’ll have to go home and unfreeze it before you can go and make your purchase. This will give you time to think about whether or not you really need it. This means you’ll be spending money you actually have, rather than increasing your debt. Plan out how much money you absolutely have to spend each pay cycle (rent, mortgage, petrol, school fees, groceries, etc) and leave that much in the account linked to your debit card. Whatever you have leftover should be transferred into a high interest savings account (ask your bank about setting one up). This money can be used for emergencies, paying off your credit card or the occasional treat. If you absolutely have to use a credit card, only spend what you know you can pay in full within 30 days (by the time the bill comes). If you have trouble keeping track of purchases, there are some great iPhone/android apps available that can help you keep a record. Be realistic with what you can afford. If you want to make a large purchase or book a holiday, don’t put it on your credit card. Save up for these things and pay for them when you have the money. It makes them a whole lot more rewarding, and you won’t spend your holiday dreading the credit card statement that awaits your return! Do you have any extra tips on how to reduce debt on the ‘fantastic plastic’?